the Depths - my second home! It was amazing that even with chaotic work schedule, I had lot of personal trips labeled as my de-stressing strategy. 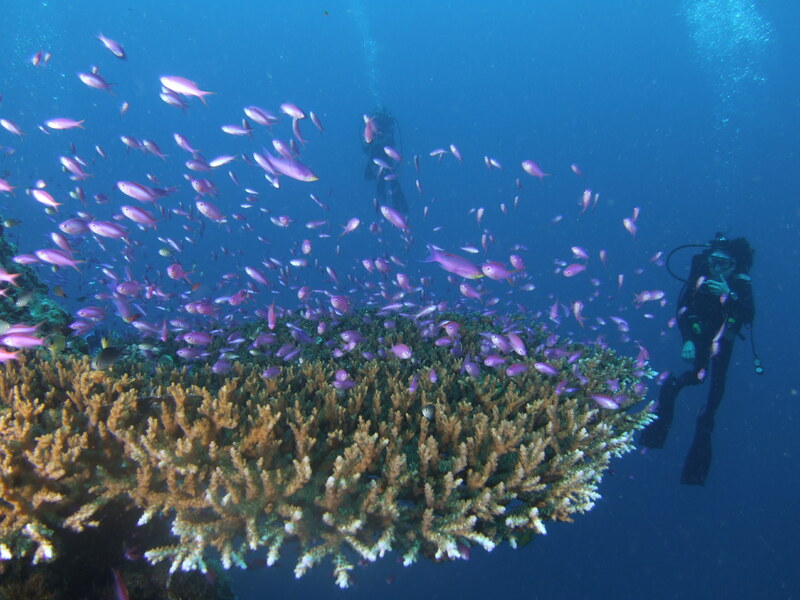 I had almost 30 dives, of which 25 sites entirely new; explored 8 new places including the famous El Nido; and have finally experienced coral transplantation at NRM site in Linamon. Though our ultimate dive trip for 2010 was indefinitely postponed, I was thrilled with new discoveries not only with underwater world but also in the highlands. I was able to scale two mountain peaks in two successive months – Mt. Pulag in the Cordilleras and Mt. Kitanglad in our very own Bukidnon – third and fourth highest peak in the country. And finally, I set foot In Sagada after 8 long years of waiting. Arranging trips and itineraries have become an art. One time, I changed return flight last minute and become absent on a Monday, I have to call and delegate for an opening message on a morning convocation! It was a feat to arrange for leaves carefully considering work trip, meetings and deadlines. I have exhausted my special leaves, force leave and took vacation leave which I don’t normally do in previous years. My greatest lesson – ascending alone after I was lost from my DM in the murky waters. The principle I use was stop, relax, think & act which I think very basic for every diver. My 29 dives of which 25 are totally new sites having an accumulated underwater time of 56:53 as of 30 December were more than decent enough considering schedules and monetary issues. My greatest disappointment – Missing the Coron monsters, I want to visit this fave site once a year. Now sporting my dive computer – an important gear I can’t imagine diving now without it! My advocacy for marine protection & preservation being reinforced by joining the coral transplantation in a marine protected area in one of the coastal town in the region. My personal goal to dive at least once a month was almost prefect except in May and October when I was in mourning and on a retreat respectively. I had seven in September. My new learning – diving with enriched air and I love it. Now, I wanted my EANx certification soon! My passion for marine quests is now on the next level, working for the underwater world has been an enriching experience for me. A call to make a difference in the marine world! Mario – I was diving with him when I was lost in the murky waters, being my OWC and AOWC professor, it was the perfect workshop! He was deathly worried and when I surfaced, he was still on the waters obviously waiting for me to show up. I can not forget the look in his eyes. He invited me and I was part again of his International Cleanup Dive activities in a marine sanctuary in one coastal town in the region. Lemuel & Mar Brandy – marine biologists, their work in marine preservation & coral transplantation has inspired and enriched me. They facilitated and work out things so I could join them for the underwater work. Angel – my good friend and favorite dive buddy, an important person in my dive trips. Without him, probably I wont be able to visit all those sites. Seventy percent of my last year’s dives were with him – perhaps our diver’s itch is on the same degree and our passion for marine life has gotten to the same level. We shared many lessons, memories and graces in our travels, and what a joy! He was so encouraging and resourceful in planning our trips. Our visits to El Nido, Malapascua, Kalanggaman, Apo Island were few of the trips tinted with extravagance and I was feeling spoiled again! Indeed, it was a plethora of wonderful and inspiring experience, the mermaid in me has always been on its fins wanting to immerse deeply in the wonderful water world. This is my journey, this is my life…. ← Blowing Bubbles in December! Pingback: Tubbataha Dream… « Life Beyond the Depths! Pingback: 2009 in Summary… « Life Beyond the Depths!